This restaurant brings a new fresh and contemporary meaning to eating Chinese food in Milan. The restaurant Mao Hunan pays tribute to Mao Zedong (notoriously known as the father to Modern China) and the Hunan province where he came from. Elegant touches such as the “red book” menu are all clever nods to this revolutionary man. Mao Hunan has a contemporary casual atmosphere infused with a minimal flair. 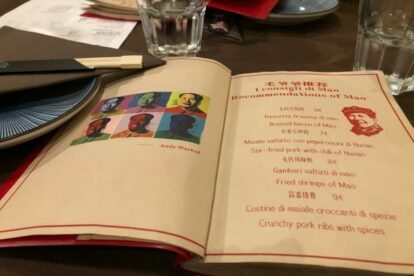 Milano is full of Chinese joints where you can eat traditional Cantonese cuisine but this is probably the only one where you will find dishes from the Hunan region. At a first glance, the restaurant might look like a modern hipster joint but don’t be fooled as here you will find heart-warming traditional Chinese dishes from the Hunan region. The dumplings are delicious, the rice is to die for and if you like spicy food you will not be disappointed! The staff is young, friendly and welcoming and they are always ready to help with their own recommendations! If you want to come for dinner, call and book a table as this spot is almost always full! This spot is my go-to comfort food spot for a relaxing night with friends. Perfect for sharing ideas, dumplings and dreams.